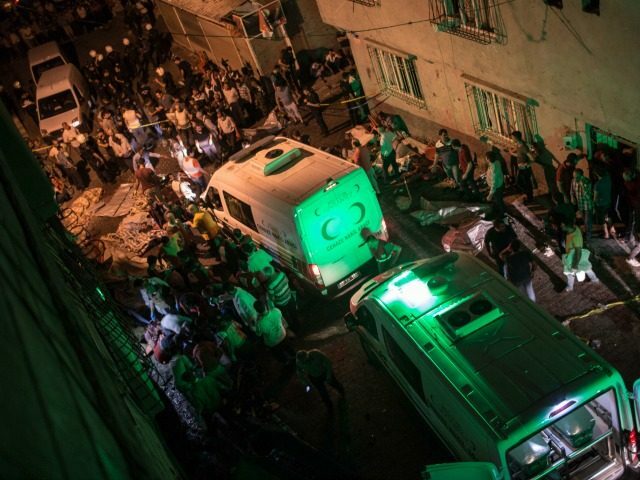 The death toll from a suspected suicide bomb attack in the southeastern Turkish city of Gaziantep has risen to 50, the local governor’s office says. President Tayyip Erdogan said it was likely Islamic State militants had carried out Saturday’s late-night attack, the deadliest bombing this year in Turkey, which faces threats from militants at home and across the border with neighbouring Syria. The local governor’s office said in a statement 50 people were killed in the bombing, and more wounded were still being treated in hospitals around the province. Blood stains and burns marked the walls of the narrow lane where the wedding party was attacked while women in white and chequered scarves cried sitting crosslegged and waiting outside the morgue for word on missing relatives. DNA forensics tests would be needed to identify them, security sources said. The pro-Kurdish Peoples’ Democratic Party, or HDP, said in a statement that the wedding was for one of its members, and women and children had been among those killed. Mahmut Togrul, an HDP lawmaker from Gaziantep, around 40km north of the border with Syria, told Reuters it was a Kurdish wedding. Islamic State has been blamed for suicide bombings on Kurdish gatherings in the past as militants try to stir ethnic tensions. Turkey is still tense after an attempted coup on July 15 which Ankara blames on US-based preacher Fethullah Gulen. He has denied the charge. Three suspected Islamic State suicide bombers killed 44 people at Istanbul’s main airport in June, then the deadliest in a string of attacks in Turkey this year. In October last year, suicide bombers killed at least 95 people when they attacked a rally of pro-Kurdish and labour activists outside Ankara’s main train station.